Situated 148 miles away from Puerto Princesa is the natural paradise many have sought to visit at least once in their lifetime. The extraordinary beauty of El Nido has captivated the hearts of both local and foreign tourists, it has also been voted as one of the best beaches and island destinations in the Philippines, even in the world. The first class municipality of El Nido is a managed resource protected area, to ensure the conservation of its rich biodiversity, beautiful white sand beaches, and one-of-a-kind natural sceneries. The protected area is established around 349 square miles and consists of the town’s maritime area, Bacuit Bay as well as its 45 islands and islets. 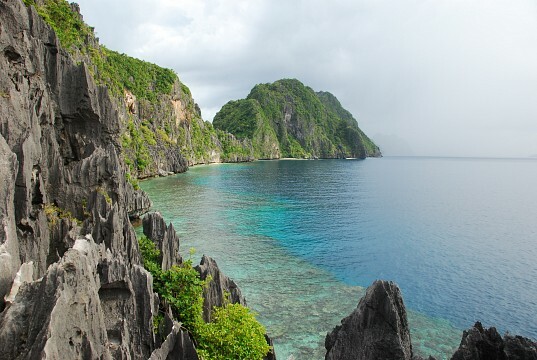 The area also includes the town of Taytay , making it (El Nido – Taytay Managed Resource Protected Area) the largest marine sanctuary in the entire country. The beautiful bay surrounded by clear, cobalt-blue waters is the jump-off point for most of the island hopping destinations in El Nido. It is also home to several species of marine life including Manta Rays, Whale Sharks, and Manatees. The Bacuit Bay also contains over 30 dive sites teeming with untouched coral reefs and other aquatic wonders. A heart-shaped island with a name derived from the native word “Matinlo”, which means “beautiful” in English. It is well-known for its secret beach (which is kind of ironic) surrounded by steep rock walls that is only accessible by swimming underwater through narrow crevices. A white sand beach strip known as the “Kulasa Beach” is also one of the top attractions on the island, along with its four dive sites around the island. 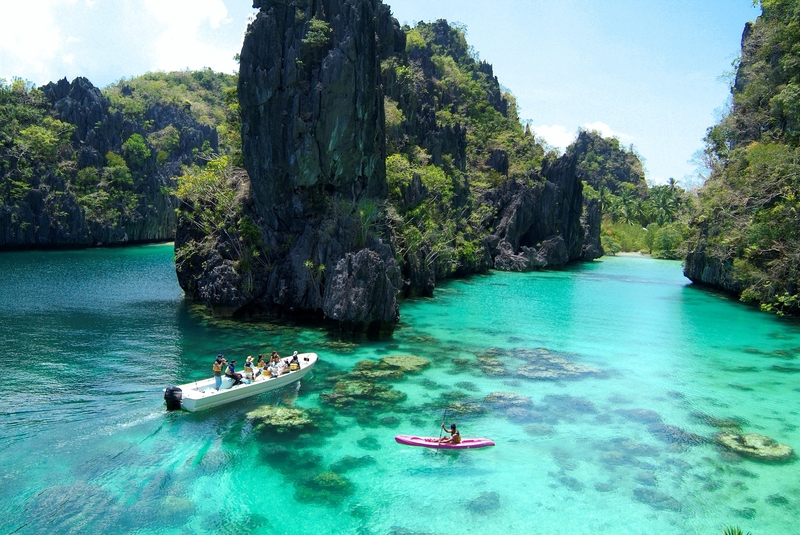 The island features a number of popular natural attractions and snorkeling spots for El Nido's visitors such as the Big Lagoon and Small Lagoon. High-end resort hotels are also found along the shores of Miniloc. More commonly known as the “Twin Lagoons”, the Big and Small Lagoons in Miniloc Island are the main attractions on the El Nido island hopping adventure. The magnificent blue waters of the lagoons are surrounded by gigantic limestone cliffs and lush rainforest. Both are great places for swimming, snorkeling, and kayaking. Seven Commandos Beach - El Nido. A beach bum’s favorite. 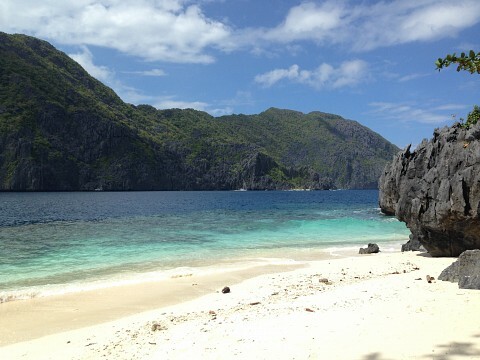 The 7 Commandos Beach is one of the unique hotspots in El Nido. The beach attracts a lot of tourists and foreigners due to its nipa cottages, powder white sand, and cocktail bar situated along the coastline. The clear waters around the beach also serves as a great location for different water activities. 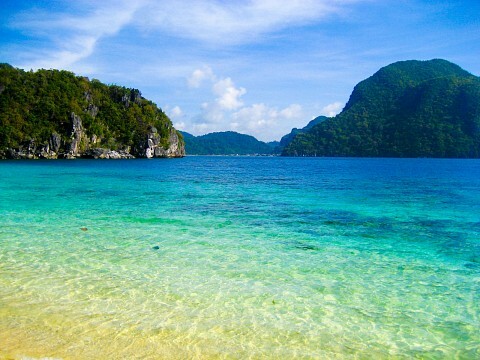 Having a land area of 3.9 square miles, Cadlao Island is simply El Nido’s largest attraction. The island consists of several hidden lagoons and beaches that are surrounded with lush verdant forests. The beautiful sights on the island are connected by a nature trail for easy access. Also known as “Helicopter Island”, Dilumacad boasts gigantic limestone cliffs and astounding coral reefs within its territory. 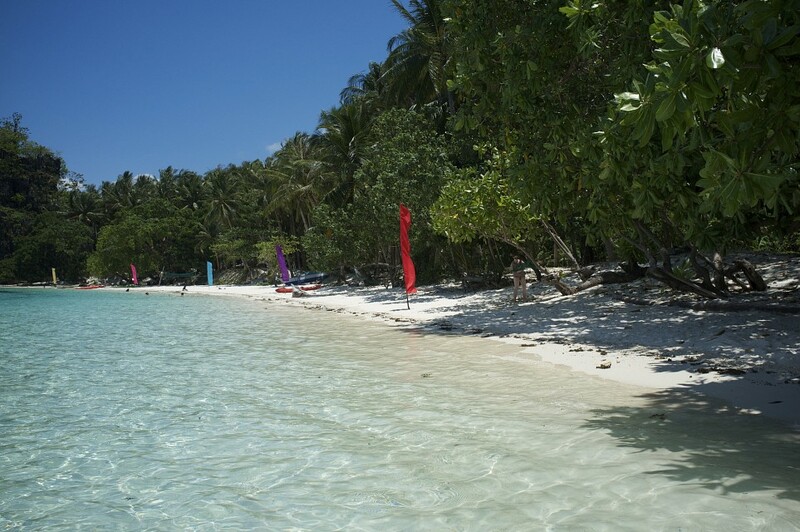 The island’s 300-meter white sand beach offers tourists an ideal place for picnics during island hopping. 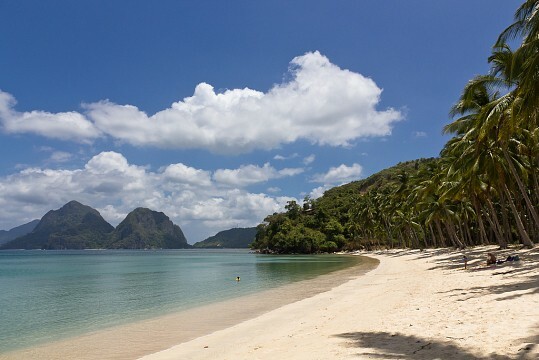 One of the major attractions included in the island hopping adventure in El Nido is the 750-meter-wide white beach strip in Pangalusian Island. The crystal clear waters around the island is also popular for its clusters of coral reefs and dive sites. Popularly known as “Snake Island” (due to the narrow snake-like shaped sandbar), Vigan Island is also one of the major attractions on the island hopping adventure. A short trek to the peak of the island will give tourists a great panoramic view of El Nido. El Nido’s beautiful paradise is best enjoyed by touring all over the different islands in the area by boat, stopping at each scenic spot. This method of sightseeing is called Island Hopping. The tour packages that are offered by major resorts in El Nido are assured to give you a wonderful and one of a kind experience. The island hopping tours in El Nido are priced by package in order to provide flexibility and affordability to the tourists. The islands visited are categorized into different tour packages, and the rates for these tours vary a little bit depending on the travel agency and the amount of members in a group. Ideally, the island hopping tour should be done with a minimum number of 10 people. The tour packages also does not include the Eco-tourism Development Fee (Php 200 per person, good for 10 days). 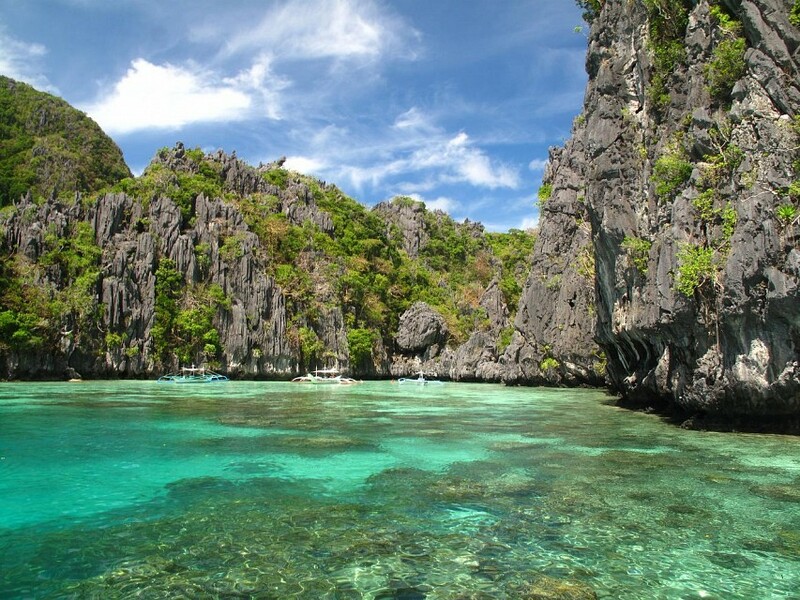 Tour A – around ₱1,200 ($26) per person. The tour includes places like Big Lagoon and Small Lagoon, Simizu Island, 7 Commandos Beach, and the Secret Lagoon. The tour starts from 9AM and ends at 4PM, headed by an experienced tour guide. The rate includes lunch, use of snorkelling gear, and life vest. Tour B – around ₱1,300 ($29) per person. Attractions that are included in the package are Entalula Island, Cadugnon Cave and Cathedral Cave, Pinagbuyutan Island, and Snake Island. Tour C – around ₱1,400 ($31) per person. The places to visit are Hidden Beach, Secret Beach, Helicopter Island, Matinloc Shrine, and Star Beach. Tour D – around ₱1,200 ($26) per person. Tour includes Bukal Island, Nat-Nat Beach, Ipil Beach, Cadlao Lagoon, and Paradise Beach. Tourists can also hire a private outrigger boat at around Php 3,900 for half a day (meals and gears not included). The rates for private boats vary per tour operator so it is ideal to ask around the area for the best deals. What's great about these operators is that they are flexible and are very willing to negotiate with the tourists. Of course, the availability of the boats and the time of the year play a significant factor to its pricing. In order to maximize your adventure in your island hopping experience, make sure you pack plenty of comfortable swimwear, or you could get wet suits at any souvenir and dive shops around El Nido. Bring a waterproof camera and secure your gadgets/mobile phones inside a zip lock bag to prevent it from getting wet. 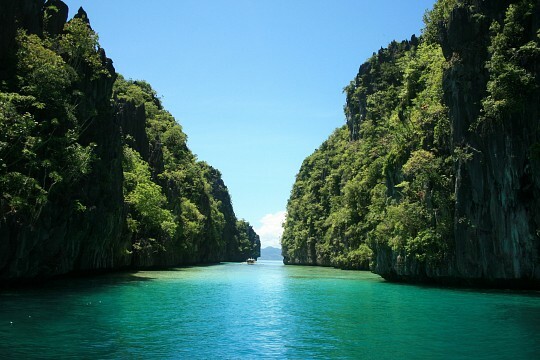 The ideal time to visit El Nido and enjoy island hopping is during the months of December to March. The season is overall pleasant with minimal probabilities of tropical storms spoiling your adventure. If you hate the large crowd when going on vacation, avoid visiting El Nido during the months of April and May (especially Holy Week), the number of people going to Palawan and El Nido is at an all-time high during this time and most of the prices are quite inflated in order to take advantage of the high demand. Within El Nido’s town proper is a thriving tourist center where most commercial establishments, restaurants, and bars are nestled in. A popular “foodie” destination around town is the nightly food fair along Calle Abdulla, where different meat skewers and grills are found. “Carinderias” are food joint that are popular all over the town for its convenience and affordable dishes. A full meal costs around ₱50 ($1.10) to ₱100 ($2.20) at these places. For tourists wanting to have some excellent dining experiences, the restaurants situated within the resort hotels of El Nido should satisfy all kinds of cravings. When talking about staying for a few days in El Nido, you might immediately cringe upon the idea of spending hundreds of dollars. But contrary to what most people would assume, staying in El Nido doesn't have to be expensive. A budget-conscious traveler can get a homely twin fan room for only ₱400 ($8.80) to ₱500 ($11) per night. Most tourists would say that their experiences in these humble inns and cottages were pleasant due to the locals' friendly nature and hospitality. For the best budget-friendly accommodations, you should check out Lualhati Cottages, The Alternative Inn; Og’s Inn, and the Marina Garden Resort, which is conveniently situated along the beach. For the affluent travelers willing to spend quite a sum of money to experience the very best of El Nido, they can check in at high-end accommodations such as Qi Palawan; El Nido Cove Resort, and the popular resort franchise, El Nido Resorts, which are situated in Miniloc, Lagen, and Panguasian Island. 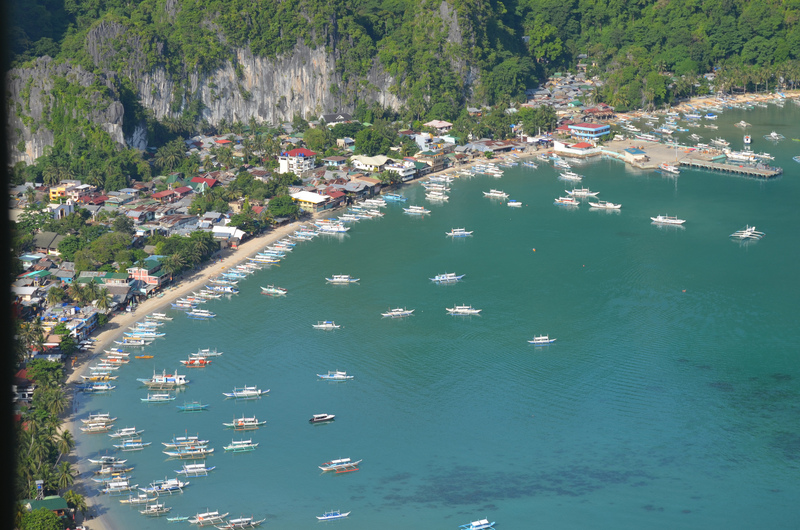 Going to El Nido can either be quick and convenient or ultimately a traveler’s nightmare. The options you can consider greatly depend on your time and budget. The most convenient and easiest way to get to El Nido is by taking a chartered flight directly. Although it sounds very promising, it is also the most expensive method of transportation. Tourists who are coming from Manila can head down to the Soriano Aviation Terminal (along Andres Avenue) in Pasay City, Metro Manila. The Island Transvoyager (ITI) operates a charter route that is based in Manila and departs from Manila to El Nido twice a day, morning, and afternoon. 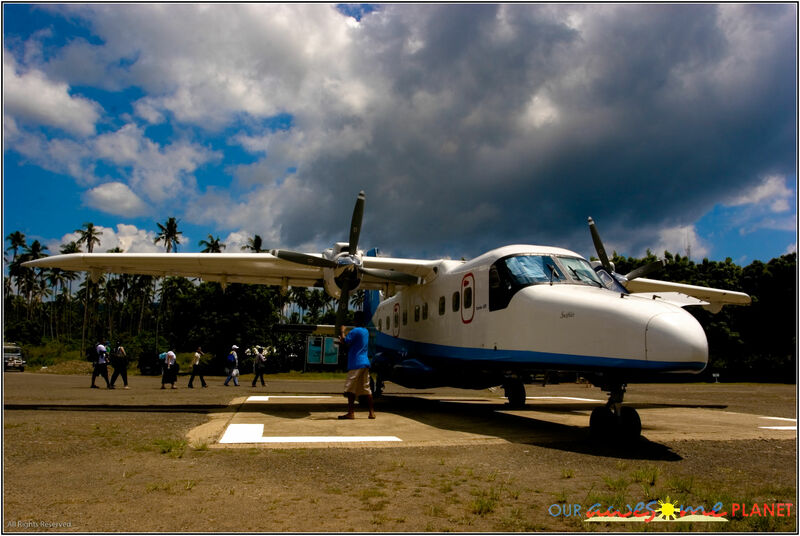 The plane arrives at the privately owned Lio Airport, two miles north of El Nido. The travel time is only an hour and thirty minutes, talk about quick and easy. You can book online by emailing their agency. Upon arriving at the private airport, tourists can get a motorcycle ride to the town proper. Considered as the jump-off point to the prestigious resort hotels in El Nido, the Lio Airport is also where most affluent visitors arrive. Tourists who are travelling under a certain budget, or the adventurous kind, can opt to choose this option, given that they don’t mind the long travel time. Domestic flights from Manila to Puerto Princesa are offered regularly by major airlines in the country. AirPhil Express and Cebu Pacific flights depart from the NAIA (Ninoy Aquino International Airport) a few times daily. Those coming from the north of the metro can also take AirAsia flights in Clark Airport, Pampanga. There are also flights from Cebu to Puerto Princesa. Upon arriving at the capital city of Palawan, tourists will have to endure six to eight hours of travel time to El Nido. Although most of the journey to El Nido passes through concrete-paved highways, the rest of the journey up north is rough and bumpy. From the city proper, tourists have a few options to consider when traveling to El Nido by land. Buses going to El Nido are available at the San Jose Terminal (a few minutes from the airport. Buses that are not air-conditioned (Sweety Transport and Eulen Joy Transport) are relatively cheaper but can be very uncomfortable for most passengers, the air-conditioned El Nido RORO (Roll on, Roll off) buses are more comfortable and offer bigger leg room than their counterpart. The rates for RORO buses are around ₱380 ($8.36) for a one-way trip. 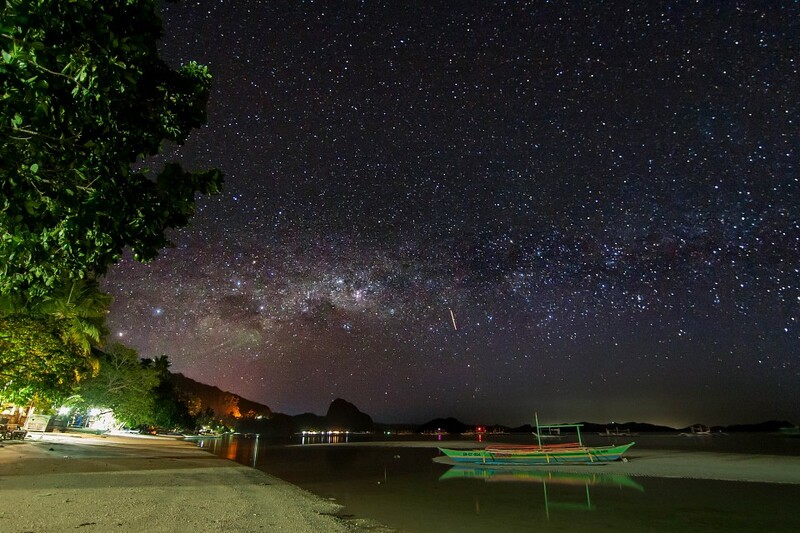 Another great option is taking a shuttle van to El Nido. These vans are faster compared to buses because of the fewer stopovers. Fortwally Shuttle Van is one of the best shuttle services in the city, the van can pick up passengers directly from the airport and take them directly to El Nido in less than 6 hours. The fare costs around ₱700 ($15) per person, or tourists can rent the whole van for ₱12,000 ($264) for a round-trip. Tourists can also get to El Nido by sea. Ferries coming from Manila are operated by the San Nicolas Lines every Wednesday and Saturday. 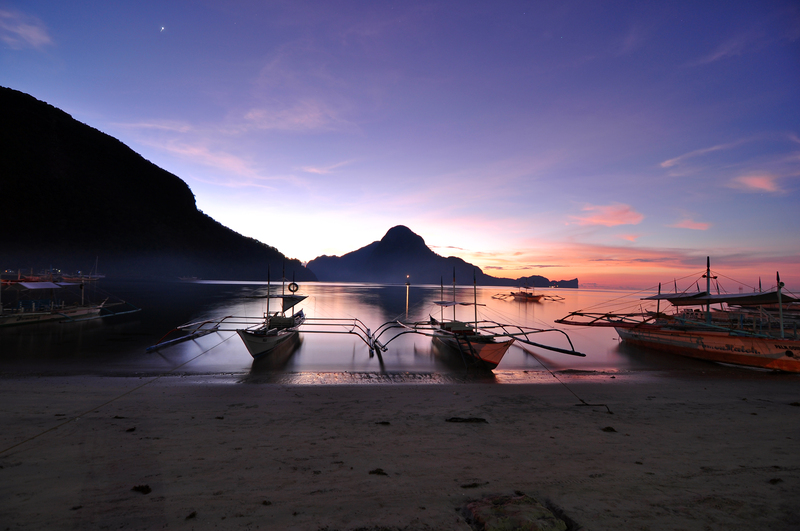 Travel time takes about 30 hours and arrives at the El Nido port in Buena Suerte. The fare costs around ₱900 ($20) for a one-way trip. Boat rides from Sabang (the jump-off point to the Puerto Princesa Subterranean River National Park) are also available. The travel time from Sabang to El Nido takes about 8 hours and costs around ₱1,500 ($33) for a one-way trip. When you arrive at El Nido, the most common mode of transportation are tricycles. There are also jeepneys available that serve routes going to other towns. Tourists can rent motorized vehicles at very reasonable prices from several providers in the town proper. The local people in El Nido are very friendly and well-known for their hospitality. The crime rate in the town proper is very low and it is safe for foreigners to stay for a few days, even months. Rolling brown-outs are very common in El Nido since the town isn't fully supplied with electricity yet. The electricity usually runs from 3 PM to 3 AM and the schedule sometimes vary. If you are not planning on staying at the popular island resorts, it is best to bring extra batteries or a power bank to charge your gadgets. There are no ATMs in El Nido so tourists are advised to bring enough money with them when visiting. Although, foreign exchange and money transfer services are available around town and most big hotels and island resorts accept major credit cards as a payment option. You might be surprised when the tourist establishment you are staying at charges you an extra ₱20 ($0.44) for every night you stay there. These are the “Conservation Fee” that every tourist must pay in order for the local government to fund the protection and maintenance of the area.